My first though on playing the Immortal Romance slot was: How could Microgaming hope to outdo the classic follow up to the original Thunderstruck slot? Well, the answer was to take it’s winning formula, change the paytable and shake the features about! Like Thunderstruck II (TSII), Immortal Romance (IR) has no winlines, but needs 3 or more consecutive symbols for a win anywhere on from left to right. 3x3x3x3x3 therefore means 243-ways to win. The symbols are 9.10.J.Q.K.A but now we have a dark underlying theme, in fact quite Gothic and in keeping with the whole Immortal Romance notion (think True Blood!). Creepy music brooding characters. We have Alluring Amber, Fang-tooth Troy, Malevolent Michael and Sinister Sarah, the highest paying character. There are only 4 picture symbols, unlike the 6 in TSII. The pays during the Immortal Romance base game have 3×9 or 10’s as the lowest, paying just 1/6 of a credit. The highest paying symbol is Sarah, of which 3 pay 1.33 x stake. For 5-line wins, the lowest 9 or 10 will pay 3.33 x stake and the highest Sarah a whopping 20 x stake. Sarahs seldom come in over 5 reels without a wild though, so on the base 30p stake Sarahs with a wild pay £12. Immortal Romance’s higher variance is immediately obvious when comparing to Thunderstruck II: wilds can appear together with the character symbols and not just numbers and letters! It is possible to get 5 wilds and Sarahs in the same spin, paying 65x the base 5-line Sarah win. This will become relevant when we examine the Amber bonus round! Two scatters, in the form of gold coins pay a credit too when they fall in, and if two fall in anywhere in the first 4 reels, the remaining reels will spin slowly in typical ‘heartstopper’ fashion, although in ‘quick spin’ this will be avoided. Should a third drop in with the unmistakeable ‘gong’ sound you will enter the bonus corridor. Before going into the bonus features this is a spoiler alert. 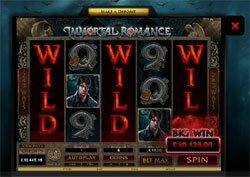 You may prefer to play this free version of the Immortal Romance slot rather than let me reveal all the features or you can watch Slotjunkie’s Immortal Romance slot video which shows some feature action . If not and you want to know the good, the bad and the ugly: read on! Now what happens? Well, you need to progress along the 4 different bonus rounds. Every 5th. feature opens up a new one of the four bonus rounds. So, the first is Amber’s 10 free spins feature, which pay at 5 x multiplier and can be retriggered. This is the highest-variance feature as it can pay fom 0 x to a theoretical 6,500+ x stake – if you got the dream hit of 5 Sarahs/Wilds!! Hitting any 5-line win with a wild pays well as effectively it’s paying 10x the basic win in normal play. Hit 5 scatters and you get 1000x just for that spin! The reels are the same as in the base game. Poor paying features are quite usual due to the higher variance of the reelmap design, but due to the aforementioned positioning of wilds by premium symbols, when they drop – well it’s payday! On the 5th. bonus, Troy’s ‘Bats’ feature is available. 15 spins with random 2 or 3x multiplying extra wilds. You need any winning combination to appear, except scatters to trigger these extra wilds. Should a win occur, Troy’s bats will cluster to a random reel position to add a multiplying wild to the win. The bats can only fly to reels 2,3 and 4. The left hand cluster is a 2x wild and can fly to reel 2 or 3, the right hand cluster a 3x wild which can fly to reels 4 or 3. Usually only one will cluster, being the 2x one. On rare occasions both may cluster down giving a 6x multiplier. If you already have a wild in play, that effectively increases the combinations (unless the bats cover it grrr…) and make the wins up to 12x base amount. This is a lower variance round than Amber but again due to the reelmaps wins of many 100’s x stake can form. This round is the equivalent of Odin’s 20 spins on TSII. When you have your 10th. bonus trigger you now have Michaels’s 20 spins with falling reels available. Any win will see the winning symbols dissolve to be replaced by falling symbols from above. Should these make another win then this will have a 2x multiplier and so-on up until 5x. This is by far the lowest-variance round. The reels are slightly different to the base game. It can also pay massive wins. You can get multiple symbols for example dropping down and not forming winning combinations, and then the reels line up and the missing one drops in when on the 5x multiplier for a multi-combination of 5-reel wins. Similar to Thor’s equivalent feature on TSII the large wins tend to come when the first 3 reels line up the same, so every time they drop you are guaranteed a win, and they do this up to 15 times before losing alignment. During this the 3 wilds can drop in, and should you have unused matching symbols on reels 4 and 5 (by now you will be at 5 x multiplier) the wins can be hundreds x stake. On the 15th. bonus, Sarah’s ‘Wild Vine’ feature is available. This is 25 spins with a special wild on the centre reel which can expand to fill any position with a wild. It has to be said, it expands to the right 99% of the time so you want to see reels 1&2&4 with matching good symbols, the Wild Vine on reel 3. Why? Because most of the time the wild will spread it’s creeping tendrils out to reel 5, completing a good payout. On rare occasions, it will go left and create an unexpected payout and has been known to even fill 9 or 10 symbols up as wilds. You will see a wild vine due to the high number of spins, but again despite the potential this is often a frustrating feature. Two scatters award you another spin to lenghten the torture. Again like TSII you have a table of ‘Achievements’ too. All possible wins, that’s 3,4 and 5-reel are lit up with a gold light in the paytable. Getting 5 wilds or scatters may take some time though! When the paytable is completely gold, what happens? Same as TSII – absolutely nothing. It’s just eye-candy…..
Not to be outdone by our mighty Norseman Thor we have the randomly activated ‘Wild Desire’ feature! On any spin in normal play, the reels may keep spinning, and blood will gloop down turning 1-5 reels wild, and the rest drop symbols in. This is where IR comes into its’ own. 3 and 4 reels wild are far more common than the old meanie Thor will deign to give us. With IR having character symbols stacked 3-high during this feature, 4-figures x stake are not uncommon. The 5-reels will pay £3650 for a 30p stake, in excess of 10,000x!!! Like TSII should you get the first 4 reels wild, you have 81 x a 5-reel win for the 3 symbols which appear on reel 5 plus you get 81 x 4 wilds, as the wilds pay separately. Again this results in 324 wins on a 243-way slot! A final note: there are effectively two versions of the Immortal Romance slot ut there: identical in every regard except for the maximum bet sizes. For more info, read my previous article on Immortal Romance’s bet sizes to see how this works.